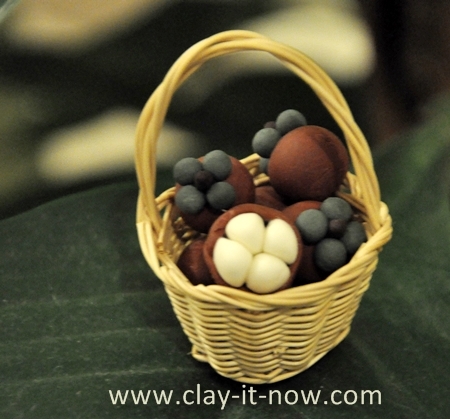 Miniature Clay Art - How small can you go? 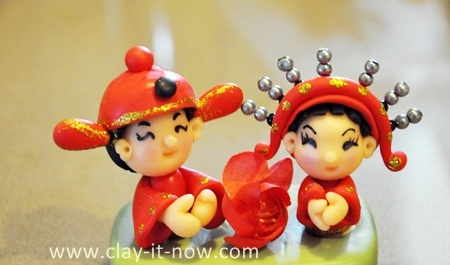 Why miniature clay art? I asked my clay buddies that question. They jokingly told me that they are aiming for the world record for smallest clay art piece. What? Are you kidding me? Well, that's not for me though. I make my miniature clay because they are so cute. I love them! I can't take my eyes off of my miniatures when I am done with my creations. Beside, no one will ever tell me whether the scale or proportion of my clay piece is right or wrong. It's an art! And, everyone is free to express their thought through their miniatures, right? Also, miniature is the world without boundary. You can go as small as possible to win the world record or just small enough to satisfy your needs. Basically you can make anything! Most people make things that are needed for doll house like furniture, household items, foods, flowers, animals, people and the mini house itself. Since making miniature with air dry clay is easy and fast, many design or architectural students making miniature with clay to bring their concept of something closer to reality. Another thing I like about miniature clay art is because there are collectors out there who keep looking for the miniatures. One of them is the wife of my ex colleague who love the minis. She collects miniature of household items used by the kings and queens. Interesting, isn't it? For me, I collect and make any type of miniatures! So are you making miniature now? You may want to check out some mini clay art ideas in my next pages. I ever attended a wedding party where the bride and bridegroom changed into more than 10 different style of dresses. All of them (traditional & modern) are beautiful. I just couldn't forget some of them and will "clayit" for sure. I've done miniature calla lily flower in soft clay. The flower diameter is about 2 cm with length of approximately 5 cm. 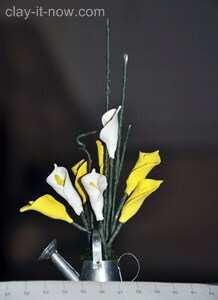 But, I forgot to take the picture of the steps so I make bigger size calla lily for my tutorial. 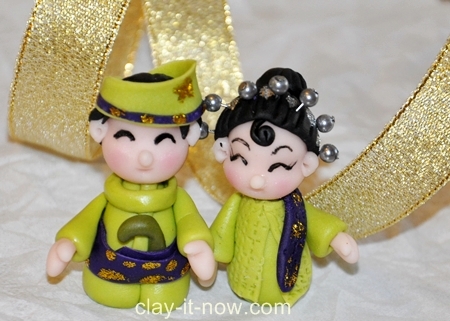 Mangosteen clay miniature: idea for jewelry charms and dollhouse kitchen and pantries items. 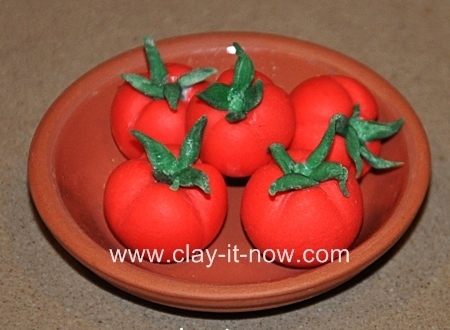 Vegetable Clay Miniature: You'll see my tutorial to make tomatoes, eggplant and chilies. 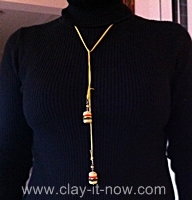 Burger Clay Jewelry: make your own earring or pendant. 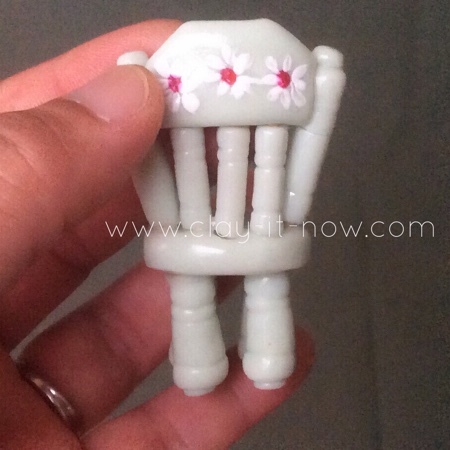 Miniature Vintage Chair or country chair is my first miniature furniture piece. If you are like me who learnt clay modeling by ourselves, you will appreciate the books written by experience clay artist or miniaturist. You may want to have a look at my favorite miniature clay books collection which had helped me a lot to develop my own style and creations. But, I would say the most impressive miniature clay book for things other than food is probably the one written by Sue Heaser with title: "Miniature Projects with Polymer Clay". She made tiny gramophone with a dynamic winding handle, spinning globe and other unique collection that would be desirable to miniaturist and dollhouse enthusiast.